Julia Litchfield, who has followed the drum all her life, is statuesque, independent, courageous, closer to handsome than pretty. Not at all the petite, sweet type her father's aide-de-camp Major Nicholas Tarleton prefers. But on his deathbed in Spain, the major marries Julia so she will have a roof over her head when she returns to England. Eighteen months later, when Julia has established an herbal business to aid the major's tenants and is contemplating a new life with an old friend of his, Nicholas Tarleton returns home-with a Spanish fiancée at his side. And no recollection of his marriage to Julia. In the dramatic weeks that follow Julia nearly loses both men in her life before the final resolution of a conflict of love and honor that might have challenged Solomon himself. "Ms. Bancroft has a clear voice and the potential to be another Mary Jo Putney or Mary Balogh." 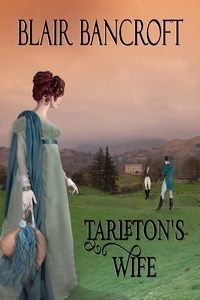 "A real historical novel, Tarleton's Wife places the author in the ranks with Victoria Holt and a handful of other writers of romantic fiction that I have read, reread, and loved." "Tarleton's Wife . . . is filled with action and emotion, and with well drawn, realistic characters headed by a strong, admirable and totally likable heroine. Every page has something happening in it, whether it's a piece of history brought to life, or the development of the plot or its people. . . . The author has an extraordinary ability to bring her characters to life and to create a real world around them."